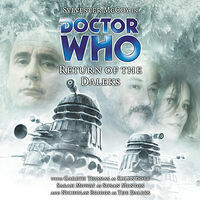 Note: Jago & Litefoot, Fourth Doctor Adventures, Lost Stories, Sarah Jane Smith, Gallifrey, Torchwood and Time Hunter audios, all previously listed here, now have their own pages. This section contains audios which don't fit into any of the other categories. "One-off" Doctor Who audio dramas released by Big Finish, which don't form part of their other ranges. "Doctor-less" audio dramas — these include Big Finish series based around UNIT, Cybermen and Davros. Anything else — interviews, sound effects records, etc.